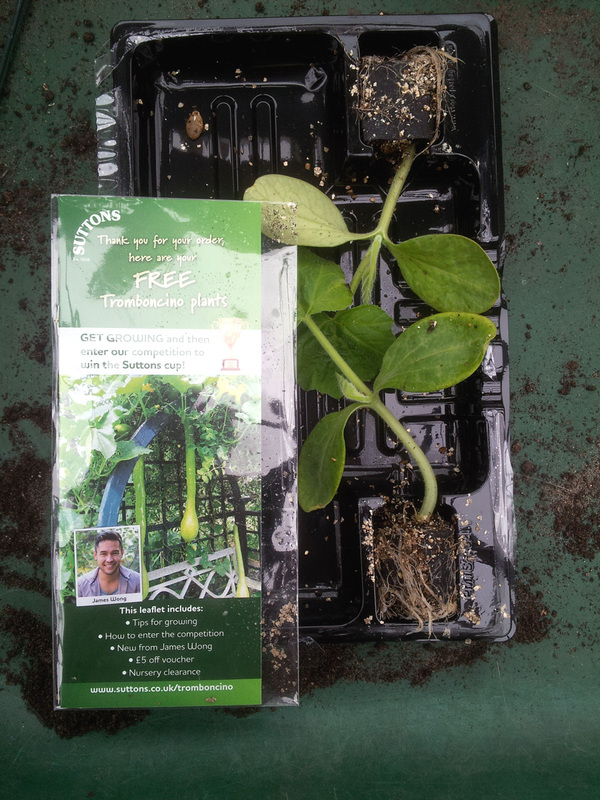 A few weeks ago I placed an order for a few packets of seeds from Suttons and ticked the box on the order form to receive two plug plants of Squash (Cucurbita pepo) ‘tromboncino’ (which, according to one online translator app means “spigot-type grenade launcher”… the mind boggles). It was partly because I’m a sucker for free plants (who isn’t?) and partly because I fancied entering the inaugural Suttons Cup Competition to see who can grow the longest tromboncino fruit. Or at least, see how close I could get to something worth entering in the competition. It’s just a bit of fun, after all. Nicely packaged, with explanatory booklet and a £5 discount voucher as well. A decent root-system on these, that just needs room to breathe. 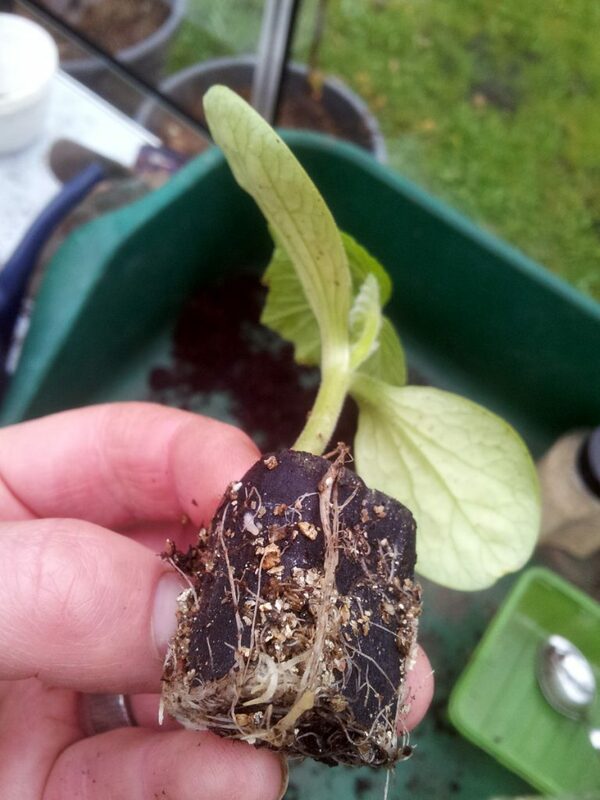 The first job was to tease out those roots and then plant the plugs in small pots with some fresh multi-purpose compost. A good watering with a liquid feed late, and they were onto a greenhouse shelf to recover from their postal ordeal and re-establish themselves. A couple of weeks in a small pot to recover and then on into a larger one with room to grow. In a couple of weeks’ time I’ll pot them on again into an intermediary container before working out where I’ll be keeping them in the long-term. 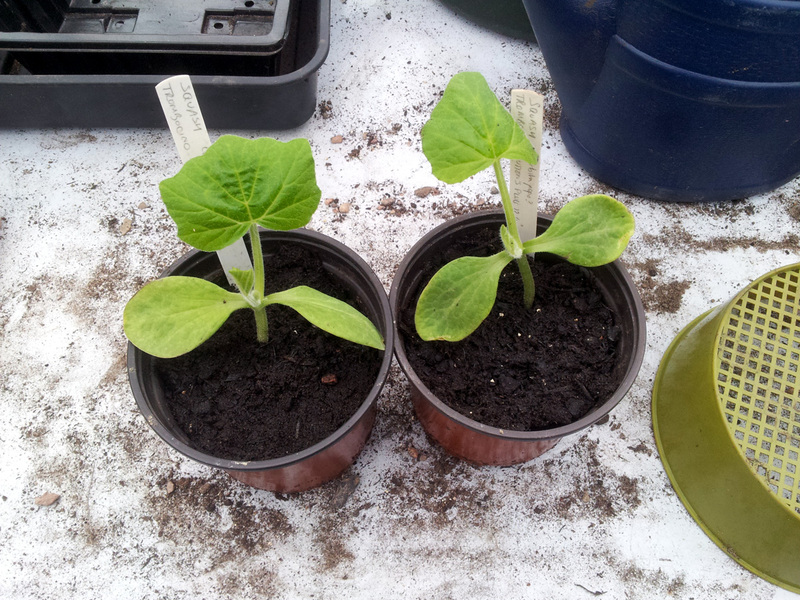 Squash ‘tromboncino’ is a vigorous climber, so I’ll need to provide sturdy support. And given my relatively poor track record with squashes to-date, I’ll need to read up on suggested optimal growing conditions and general care / feeding instructions as well. I did mention it’s just a bit of fun, didn’t I..? Mind you, they’re still only a few inches tall at this stage – I expect they won’t get going properly until temperatures come up a bit more and I can get them into the ground.